So this is my card I am sharing with you today. I wanted to do a lot of sponging inks. I love the effect of sponging and blending colours. On this panel, I blended Gathered Twigs, Vintage Photo, Crushed Olive, Salty Ocean, Mermaid Lagoon and Faded Jeans. I went back and forth a few times to get even blending. I then spattered clear water on the panel and mopped them off with a clean towel. 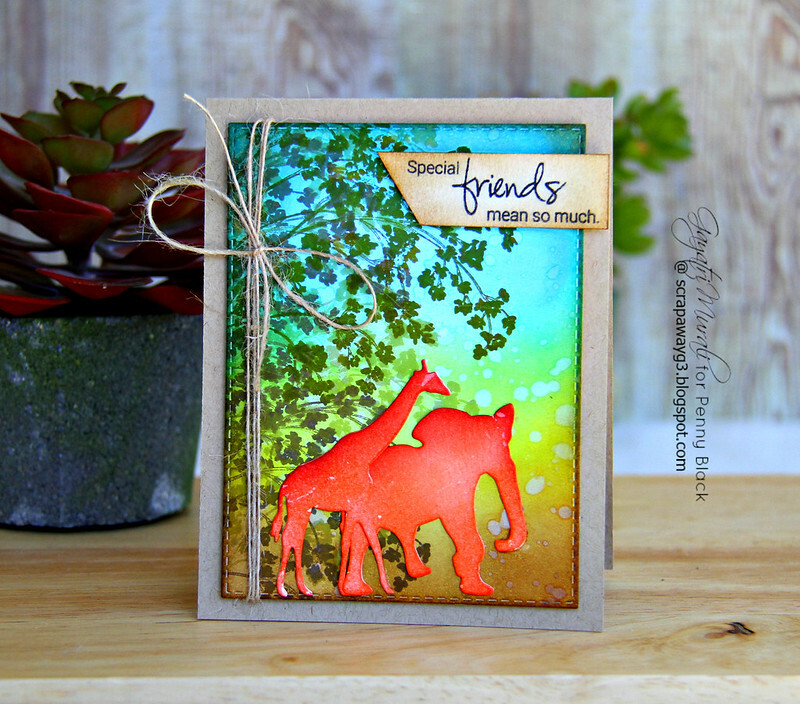 One the left side of the panel, I stamped the Gentle Breeze stamp from Penny Black using Soft Olive, Cup o Joe and Forever New Hero Arts inks. This three layered stamping gives depth to the whole scene on the panel. I have been hoarding this On Safari die set from Penny Black for a long time. I love them and have been thinking long and hard how to use them creatively. 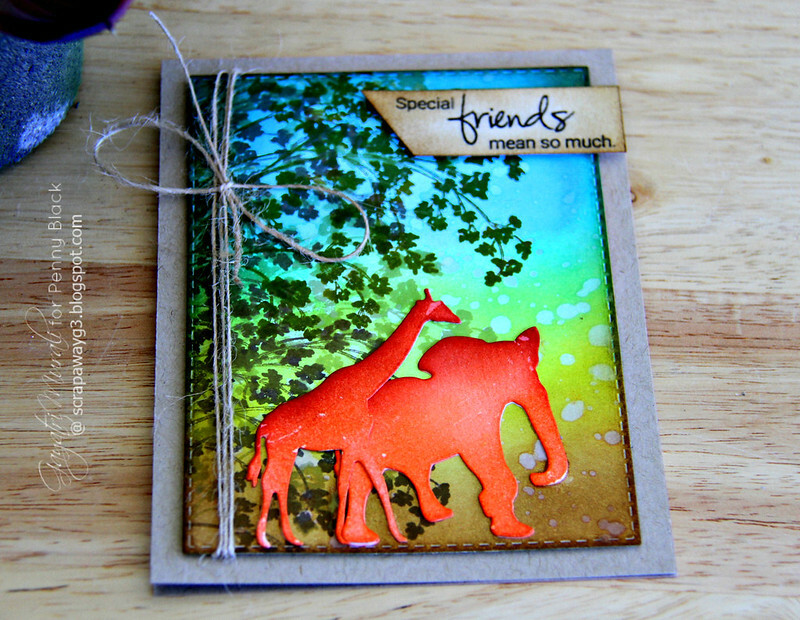 Although I have a few ideas in my mind, I thought the giraffe and elephant on this background would be perfect. So I die cut them out and sponged them with Ripe Persimmon distress ink. I adhered them on to the background panel next to each other like special friends. 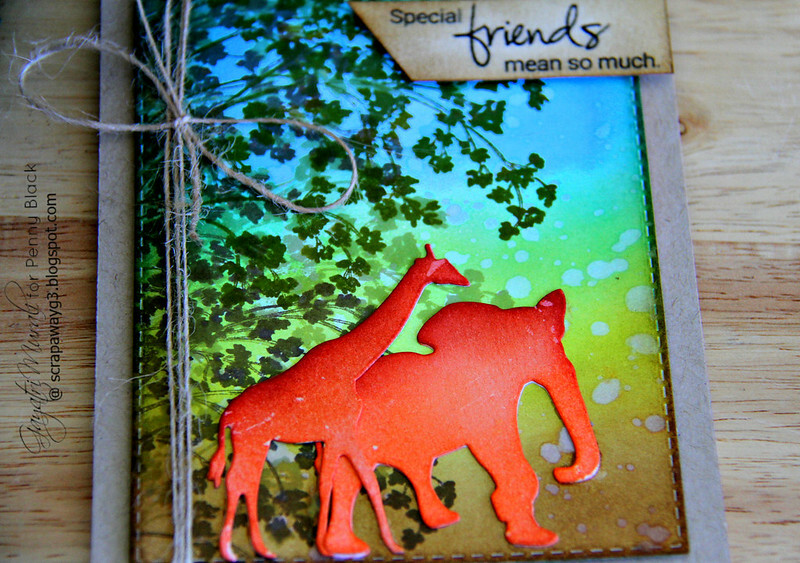 Thus the sentiment on the card from Mimi’s Love stamp set also from Penny Black. I added jute twine with a bow to bring in some texture to the card and also tie in with the kraft card base. I love the inking of the background scene and how everything came together. I enjoyed making this card. Hope you like it. Here are all the three Penny Black products, I used to make my card. They are all available at Penny Black store. I have recently discovered your blog and love your art! Thank you for sharing your talent. I have enjoyed your Christmas cards – I, too, am ready to move into Valentines and spring cards.